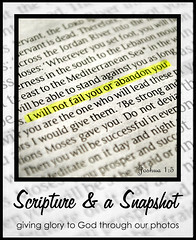 Visit Katie to see more from Week 6 of Scripture & a Snapshot. what a wonderful way to illustrate this verse. Joining you at Katie's. Awesome job Marsha!! 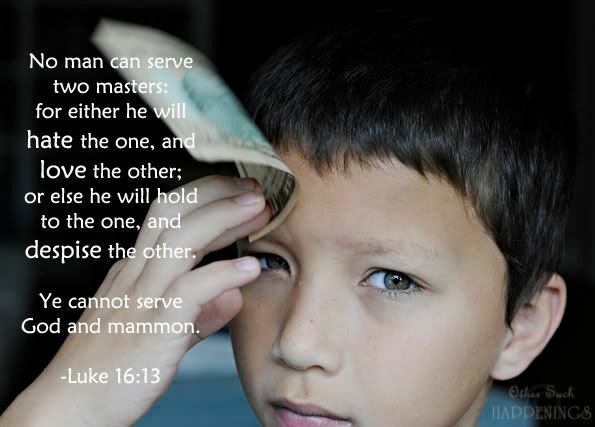 I love that he has such a serious look on his face - because this really is a serious verse, especially in our money-hungry culture. Boy oh boy! Doesn't the world need a good dose of this verse these days. Hubby and I were just talking about how materialistic everything has become. I am so thankful to be married to somebody who would give our house away if that is what the Lord said to do. good teaching lesson great post. Great job,.... I think at different times we can all use a refresher in this verse... Love yoru picture! His face! Is he in pain, sad, confused or just contemplative? Either way - it's a great expression! :) As always, Marsha, great shot and great match-up between pic and verse. I don't get to look at blogs much, but I love your blog. It is beautiful to look at and inspirational to read and fun. So fun to connect at Relevant. Blessings of His love and grace today!